Recently, Compass Creative principal Jason Bouwman sat down for an interview with Ralph Kikkert of Strive!, a company helping organizations through better board governance. Ralph and Jason talked about a variety of issues related to organizational vitality and discussed the principles behind successful marketing, authentic brand experiences and leadership. The following transcript has been edited for brevity, but if you’d like the full interview, you can listen to the audio version. Ralph: Now Jason, let’s just get right into this here and ask the question: Why we do need to plan? You’re big into designing websites, helping people understand their brand. Why not just start marketing and building the website? Give us some of your thoughts there. Jason: Sure. We actually use the expression “insight before website” where we’re trying to answer that question. People don’t really want a website per se. A website is a very comprehensive tool to communicate a message. The reason you would be communicating a message or engaging with an audience is because you want to persuade them to take some form of action. You want them to sign up. You want them to become a donor. You want them to buy a product. You want them to spread the word, or whatever it is, but you’re persuading someone to take some course of action. But no one owes you that. So before you can ask that thing of people you need to explain yourself and why it’s in their best interest to do what you’re asking. You need to know what you’re selling. Before that, you should know that they want it and why (product development). You need to know how it is that you’re going to be different in a competitive marketplace. You need to know how yours is better, faster, cheaper, more exciting, whatever it is. Prior to that you would have had some sort of vision of what success looks like. Prior to that you would need to know why you exist in the first place so people will come to (you). So why do you need a website? We tend to get in very deep and we go all the way back to …why do you even exist? Jason: Correct. We can build a website to spec but what we’re noticing is that rarely do people come to us with all of these prior questions thought through and articulated clearly. Rarely does a client come in and say, “This is who we are. This is our market. This is our product. Here’s how we’re different. Here’s our story. Here’s exactly how we want this tool to function. Here are the specs, here’s the content, go build it.” That doesn’t happen. And it’s not just with websites. It’s the same with brochures, with brand identity, with language. Basically, all of marketing. A lot of what we do is really creative storytelling. We’re always telling someone else’s story and so we can’t just make things up for people. The stories have to be true. At least, that’s our value system – we need to be telling the truth. So we have lots of questions before we go and tell stories. Ralph: When you say “insight before website” are you really saying, “I need clarity on who you are, what drives you, what you really want”? Is that really what you’re getting to when you say “insight before website”? Is that really a summation of it? Jason: That’s correct, yes. But a website is not only storytelling. It’s also a functioning [business] tool as well. Like I said, it’s a very comprehensive expression of a brand and there are a lot of decisions that we will make in the design process to achieve a certain outcome and those decisions need to be informed by insightful thinking. I would say that there’s a sliding scale. The quality of marketing and communications goes up with the quality of the idea or the quality of the thinking. If you graphed it out there would be an angle going up and to the right…the quality of what we do gets better with the quality of insight and ideas that we have around the organization. Ralph: One of the other things that you talk about, and this is true for strategic planning for all organizations, boards and non-boards, is this whole question of…you need to do something for someone else or they need to value something or if you want to get paid you need to have some service, some value. Talk a little bit more about that. A for-profit organization – even not-for-profit organizations – are typically looking to generate revenue, but you don’t exist just to do that. That becomes very self-preservational and we all have to do that. We all have to make an income and we all have to look after ourselves and our families. That’s a given. Everybody needs to do that. So when an organization is too focused internally on what they need and their marketing doesn’t really think in terms of where the customer is at…what do they really need…how can we help them. Because that’s ultimately a more compelling story to them down the road. Ralph: I’ve heard you also say something like “Everyone has a vision. Talk a bit more about that statement. Jason: It’s just a notion that I have more than anything. But the more I think about it - it tests out. Too often we run into a bit of a roadblock in our consultations with clients when we ask about vision. There’s silence or there are a lot of blank stares. So we’ve tried to figure out why that is, and I think some of the hesitation to share a vision may be that they haven’t thought deeply enough about it. Maybe the vision is very self-serving and it sounds bad to share it with people. There are a lot of reasons why it doesn’t necessarily come out. But I think everyone has a vision. It’s just the scale of it that is different. Entrepreneurs and forward-thinking people have these grand visions of how to change the world. Some people will have a very small vision, i.e., I have a vision of how to get through this day. There are things that I can envision changing in the next hour. It may not be very compelling, but it’s still a vision. So I think everyone is capable of envisioning a future state or a changed state. It’s really more about the scale or the scope of it as opposed to the existence or nonexistence of it. Ralph: How often do we use that terminology in our language, “what’s your vision?” How many people ask “What’s your vision for our organization?” This is a great question to ask every board member every year. Why don’t we share more of this? Why don’t we talk more of this? Jason: I think part of it is personality. I think some people are more reflective in nature. Some people are more creative in nature. We’re all gifted differently - I think that’s part of it. I’ve been talking recently to financial planners who put financial plans together for folks. They have the same questions, “Well, where do you want to go?” or “What’s your vision?” They’ve found that very few people are naturally predisposed to this sort thinking. For others, if they are challenged to tell the truth, they might find that their vision is very internally focused. Jason: Self-serving, yes. And I would raise my hand and say I’m guilty here as well. I learned this through a book called The e-Myth by Michael Gerber where he talked a lot about small businesses. A business or organization is a vehicle for someone to create a microcosm of the world and control how things are done within that space. But as the organization grows, with more people on board and the need for more revenue, your story needs to change from simply “Hey, hire me - I’m good at this one thing.” to “Well, here’s what we’re trying to do. Here’s the plan.” You have to have bigger and better ideas to progress and grow. Ralph: People don’t typically ask me what my vision is and I think sometimes they may be afraid that I wouldn’t know what the answer to that question would be so one of the keys I would suggest that I’m hearing from you is just know thyself, know what you want, and know how you’re unique. Jason: I would agree with that. I think another reason why is the element of focus. Sometimes there’s a heavy fog in the way and you need to identify what that fog is and get it out of the way so that you can see forward again There needs to be honesty around this issue when we talk about visions like “What do you see? What is this thing that you’re envisioning?” Either it’s a very clear picture or it’s not, but then at least let’s sketch it out in broad strokes so that we can get some help to define it. Jason: Yeah. I think my reaction would be to run at that point. We all have a choice and we choose who we work with and who we work for and who we share our gifts with and who we want to help. It’s very interesting that you ask that question because one of the struggles we have in new business development is finding people whose mission and vision we’re energized by. We’re going to do better work, we’re going to be more creative, we’re going to service that client better if we actually buy into what it is they’re doing. Our response is always…”Well, are you?” and if the answer is “No” then I need to call them out and say, “Well, you’re basically asking me to lie for you and I don’t really want to use my talents to do that.” So I would run. Connected to this, I kind of sketched out a little diagram based on people’s vision and their interest in helping others. If you split these into quadrants you get four very different kinds of people. If you have big ideas and you’re very creative, but it’s all about helping yourself, we call those people ambitious and that’s not always a compliment. Ralph: Other-focused. Good followers likely. Jason: Yeah. We need people like that but it’s not necessarily a leadership position. And if you have big vision, big ideas, a crystal-clear idea of where you want to go, and it’s very much about serving the needs of others, that is probably the most compelling position in terms of aligning people behind you. Ralph: That is likely the greatest leader of all the four quadrants as that’s where the true leadership comes and that’s where leaders really shine. The other ones on the left, the ambitious or the panhandler, are found out and the one on the bottom right is a great follower and supporter and encourager but may not be willing to take a risk. The one in the upper right is the one that is other-focused first and second is willing to take leadership. Jason: Correct, and this is obviously a bit of an oversimplification. 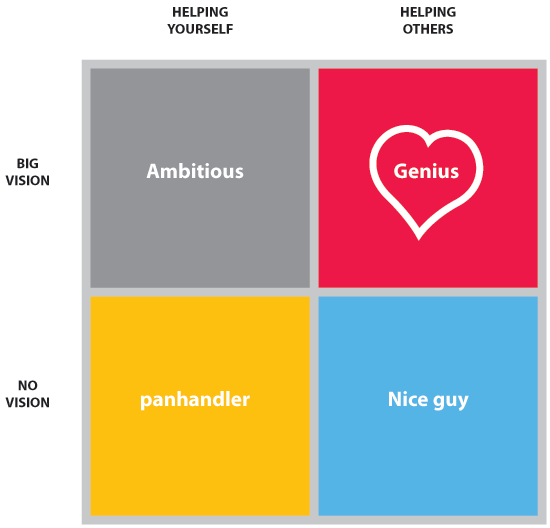 I think we would find ourselves, if we were honest, in any one of these quadrants at different times in our life. Ideally, we wouldn’t find ourselves in the bottom left corner very often but there are times when, through weakness or whatever, we find ourselves there. And in each of these quadrants you have different issues as well. The top left quadrant is very ambitious, maybe with big ideas. A very creative person exists in that place but will find that it’s not very sustainable. They have to keep creating new ways of either tricking or manipulating people into supporting their big vision. It’s for themselves because there’s really no win for anybody else. Whereas on the right, when it’s really about helping others, you draw talent, creativity and ideas to an organization because it’s really not for any one person. It tends to be bigger than that. The subsequent parts of this interview, on alignment and marketing, will be posted here on the Compass Creative blog over the next two weeks, so be sure and check back to get the whole story.